Cabin was very clean , love the view ,had everything we needed , comfortable heat and sleeping.parking and walking down the hill with luggage and coolers was another workout,more blinds would be good. Such a great location right next to the water with so much sunshine. Very nice and comfortable cabin to stay in and in a great location on the shore. We loved the townhouse, very clean and had a well stocked kitchen. The location could not have been any better, the harbor was outside our patio door. Loved being so close to downtown for shopping and restaurants. Very comfortable bed and furniture and loved the soft water! Poplar Creek Retreat: Wonderfully quiet & secluded location. Lovely cabin with a nice open lay out. Clean. Our family really enjoyed it. We saw a bear just a few hundred feet from the cabin. The neighborhood moose eluded us though. The online booking system was easy and check in/out was a breeze. Only downfall: The lake access is limited and dock is very small. No soap for dishwasher. GPS coordinates may have been helpful in finding location. We will definitely stay again! I have stayed here a number of times and each time it just gets better! 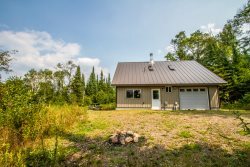 The house is spacious, comfortable and conveniently located so we can access all of the amenities of that north shore metropolis, Tofte! Loved how clean the cabin was and the view was incredible. We would definitely stay there again and recommend it to our friends. Not that it is very important as who really wants to watch tv in that beautiful location, but it was so small we couldn't see the news unless we were standing right in front of it. The house was beautiful, close to where my sister lives, had a lovely kitchen,with beautiful dishes and glassware. Enough baths for all of us. The beds were comfortable, and we appreciated the ceiling fans.The kitchen/dining area had a huge table for all of us to sit around and talk. The living room is quite small, but big enough for 7 people to sit in, or watch TV (if that's what you want to do) There is a really nice laundry room, which we didn't use. I would have liked to have seen at least one chef's knife in the house; I usually bring my own knife, but I figured for $300 per night, I wouldn't have to.The fireplace was very pretty, but we had no idea how to work it, and we found no instructions.The lake is a lovely short walk from the house, with a dock to sit on and a great view. It is a nice quiet area to stay. Absolutely loved the cabin and location. Beautiful and serene. We have rented from Cascade for five years and have always found the experience positive. The properties have all been great and maintained. The property is amazing. The beach area with the cove and waterfall were gorgeous and we had a hard time leaving here at the end of our stay. The cabin is older and needs some updating. great location. we come every year. Great views of Lake Superior. The condo was perfect for our needs. Liked the view, two decks, roominess, sauna, very clean and comfortable. Only thing I would do is replace the carpet with wood or tile flooring. The home is beautiful, well-equipped, comfortable and an entirely lovely place to stay. The service was excellent. My only suggestion would be to find another spot to put garbage and recyclables at the end of the trip. The gravel road is a bit of a challenge and, when we left, construction vehicles were blocking the path so we ended up carrying the garbage all the way home! Everything else about the home and service was delightful. As many times as I have stayed at the Chateau, I have never had a bad experience. Unit 26 is always clean, the beds comfortable and, of course, the view from the deck always inspiring. Some of the "issues" we had were (1) no dishcloth(s) for washing dishes (luckily I had one with me that I was bringing back from our summer place that we used); (2) no scissors in the kitchen; (3) incomplete set of measuring cups; (4) not enough places in the main bathroom to hang wet towels (especially if you have more than 2 people staying in the unit). I would suggest somewhere whether it be on the website or in an e-mail confirmation that guests need to provide their own tin foil, baggies, plastic wrap, napkins, etc. We had to buy those things in Grand Marais. However, those are just minor things. It did not impact our stay in anyway!!! The location was perfect. Quiet, barely any sound from, the road. Remote enough, but not isolated. I loved it! The house is beautiful, spotlessly clean, nicely furnished. I can't think of anything that wasn't perfect. The location was great! Just about a half mile from downtown and the lake. Easy walking to restaurants, shopping and the shore. The Blue Bungalow is very cute and renting with Cascade Rentals has always been easy. We have stayed in several properties and they were are all very nice and well kept. The remodel was very well updated, very comfortable for two people. There is zero flat space for luggage. You end up with suitcases on the kitchen chairs. Would be fairly easy to convert one of the closets to some luggage shelves. Beautiful location. Cabin was clean on the inside. The outside could have done with some clean up. The road in should have been mowed. Owners are very nice folks. Steps to the beach were a nice touch. Short on toilet paper.